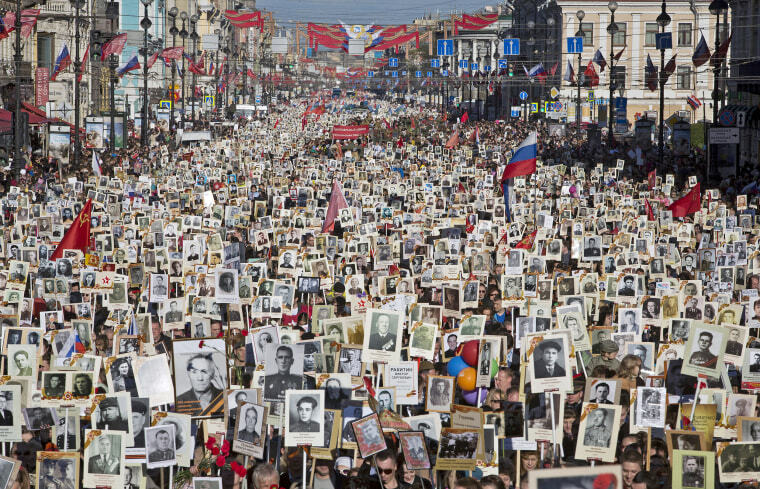 Thousands of people took to the streets in Russia with portraits of their ancestors who fought in World War II to mark the 70th anniversary of victory over Nazi Germany in an event called the "Immortal Regiment" march. Russian President Vladimir Putin led more than 500,000 people through Red Square, one of the largest turnouts in memory, carrying a portrait of his father. The march was preceded by a parade of tanks and troops, an event boycotted by Western leaders over Russia's role in the Ukraine crisis. Putin has used the anniversary to whip up patriotism and anti-Western sentiment.